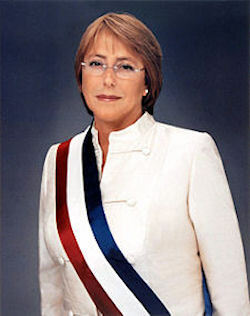 Veronica Michelle Bachelet Jeria was Chile's first female president and the fourth consecutive Concertacion president. She was elected in 2006 in Chile's fourth presidential election since the end of the Pinochet era in 1989. All four have been judged free and fair. She is known to have revolutionarized the trade relationships between South America and Asia-Pacific. Even some voters from the right exhibited a certain pride that conservative Chile had elected its first female president, and one who does not fit the traditional Chilean socio-religious mold. Michelle Bachelet, defeated her opponent Sebastian Pinera in a Latin American country where the political scene is traditionally men’s domain. Chile is almost 90 percent Catholic and culturally conservative. It has the region's lowest percentage of women in the workforce. Divorce was illegal until 2004 and abortion remains outlawed. But Chile’s new leader is a single mother who says she is not religious and whose successful professional career includes pediatric medicine as well as politics. Bachelet was the first woman in South America to be elected president without first becoming known through her husband. Bachelet had held ministerial portfolios in the Chilean Government as Minister of Defence and Minister of Health. As Defence Minister, Ms. Bachelet introduced gender policies intended to improve the conditions of women in the military and police forces. As Minister of Health, she implemented health care reform, improving attention to primary care facilities with the aim of ensuring better and faster health care response for families. Michelle Bachele was born in Santiago, Chile, on 29 September 1951. She has three children: Sebastián, Francisca, and Sofía. She trained as a doctor, with graduate studies in Military Sciences. She speaks Spanish and English and has a command in German, French and Portuguese. Her mother, Ángela Jeria, is an archaeologist. Her father, Alberto Bachelet, was a General in the Chilean Air Force. In 1970, Michelle Bachelet accompanied a friend to the Posta Central, a major public hospital in Santiago. Although she had previously been thinking about studying Sociology or Economics, her time at the hospital led her to study Medicine at the University of Chile, as a concrete way to relieve people’s pain and improve healthcare in Chile. A leader in student political affairs, during the Unidad Popular (Popular Unity) government of Salvador Allende she participated in the Socialist Youth movement. Known for exceptional organizational talents developed during his time in the Air Force, her father was asked by President Allende in 1972 to head the government’s Price and Supply Committees Juntas de Abastecimiento y Precios, and remained there until General Augusto Pinochet led a coup against Allende’s government on 11 September 1973. General Bachelet was arrested that same day and held captive in the Air War Academy, accused of “treason against the homeland.” He was later moved from the Air War Academy to a public prison. He died there on 12 March 1974, having suffered a heart attack as a result of the strain on his body from the torture to which he was submitted. Despite the traumatic events that affected her family and her country, Michelle Bachelet continued studying and participating in Chile’s Socialist Party. On 10 January 1975, two agents from the DINA (Dirección Nacional de Inteligencia, the Pinochet regime’s secret police force) came to the apartment she shared with her mother, blindfolded both of them, and took them to the Villa Grimaldi, the DINA’s main torture and detention centre. Later, both mother and daughter were moved to the Cuatro Àlamos detention centre, where they remained until the end of January. Bachelet and Jeria traveled to Australia as exiles. Michelle Bachelet returned to Chile in 1979, and continued her studies in medicine at the University of Chile. But the government of Augusto Pinochet refused to let her work as a doctor. Once democracy was restored in 1990, there was immediately a great need for professionals to help restore the country’s public health system, which had been neglected by the dictatorship on a massive scale. Her experiences both as a member of a military family and a member of the civilian political sector led her to feel that prevailing political sentiment did not sufficiently value defence policies and their institutional, political and cultural implications. Michelle Bachelet was chosen by the Central Committee of the Socialist Party to run for the city council of the Santiago-area district of Las Condes in 1996. In 1998, she was chosen by the party’s Central Committee to join its Political Committee, where she remained until 11 March 2000. She worked as Ricardo Lagos’ campaign manager. In 2000, Michelle Bachelet was named Minister of Health in President Ricardo Lagos’ administration. On 7 January 2002, President Lagos reshuffled his Cabinet and moved Michelle Bachelet to head of the Defence Ministry. She was the first woman both in Chile and in Latin America to hold such a position. During her tenure as Defence Minister, Chile’s rules about obligatory military service were modified in key ways, the role of the Ministry and the government in military affairs was strengthened, and equal-opportunity policies were instituted for women in the military, the Carabineros Police and the Investigations Police. President Ricardo Lagos, who was riding high in the polls at 70 percent, as incumbent was constitutionally barred from serving consecutive terms. Concertacion presidential candidate Michelle Bachelet's slip in the late 2005 polls to 40 percent increased the likelihood that no candidate will win more than 50 percent on 11 December and a run-off election will be required. Bachelet's two main rivals -- the Independent Democratic Union's Joaquin Lavin and the National Renewal's Sebastian Pinera -- continue to poll separately in the high teens or low 20s. Bachelet's numbers and charisma assured her a strong showing on December 11. However, there was no guarantee she would win the 50 percent plus one vote required to secure a first-round victory. For the first time since democracy returned to Chile in 1989, the center-left governing Concertacion coalition secured a working majority in both houses of Congress as a result of the congressional elections on 11 December 2005. When the new Senate takes office in March 2006, Concertacion will hold 20 seats and the center-right Alianza opposition 17 (there will be one independent). Ten seats held by senators-by-appointment are to be eliminated effective March 2006, reducing the total number of senators to 38. Concertacion's working majority in the Chamber of Deputies is slightly larger than in the Senate (65-54; one independent). The far left coalition, including a small communist party, once again failed to gain a seat in either chamber. Ruling center-left Concertacion coalition candidate Michelle Bachelet and center-right National Renewal candidate Sebastian Pinera emerged from the first round of the presidential elections as the top two vote-getters and faced each other in a run-off on 15 January 2006. According to the first-round results, Bachelet won 45.9 percent of the vote; Pinera 25.44 percent; Independent Democratic Union's Joaquin Lavin 23.23 percent; and "Together We Can" coalition's Tomas Hirsch 5.39 percent. Chile's Communist Party endorsed Socialist presidential candidate Michelle Bachelet in January's runoff election. Communist supporters account for about five percent of the vote in Chile. The ruling center-left Concertacion coalition's candidate Michelle Bachelet defeated center-right Alianza opposition candidate Sebastian Pinera in the January 15 run-off election. Bachelet had 53.51 percent of the vote, compared to 46.48 percent for Pinera. Pinera conceded the election, and there were no reports of election irregularities. Bachelet swept into office promising a new style of politics. A cabinet of young, fresh faces, technocrats with ideas, perfectly gender-balanced, would reach out to "the people." Drawing on Chile's copper-export fueled budgetary surplus, the Bachelet administration would address the nation's social inequities, focusing especially on education, health care, and pension reform. Expectations were high, as were Bachelet's poll numbers, then hovering in the mid-60's approval range. President Michelle Bachelet marked the halfway point in her four year term on 11 March 2008, a milestone perhaps become millstone, an anniversary freighted with the weight of unmet expectations. With her ratings in the low 40's (albeit stabilized), a reflective Bachelet, interviewed in a leading daily, said "It's been a difficult two years, but I don't complain." She may not, but she certainly doesn't lack for critics who do. A series of corruption allegations in government ministries, three cabinet shuffles in 20 months, and then, most disastrously, the Santiago mass transit "reform," all gave the opposition fodder for attack. Bachelet also lost her working majority in both houses of Congress, as disgruntled members of her center-left Concertacion governing coalition abandoned her to either take up with the opposition or pursue individual political ambitions, putting at further risk a legislative agenda already short on glittering achievement. Bachelet promised to continue free market policies that have fueled rapid growth here, but also campaigned to boost social spending to close the income gap between rich and poor. President-elect Michelle Bachelet got off to a quietly assertive start following her victory over Alianza opposition's Sebastian Pinera in the January 15 presidential run-off election. Her initial public statements and meetings appear designed to show her intention to govern independently, while working closely with the Concertacion coalition party machinery. Michelle Bachelet's appointments reflected a clear effort to integrate younger people in an attempt to promote generational change. As was the case with those who preceded her, Bachelet wanted to begin office with a differentiating mark. Although she appointed some 'traditional leaders,' it seems the president-elect wants to keep some distance from the Concertacion political coalition's establishment. Chile's President Michelle Bachelet rejected any amnesty for those accused of crimes during the 17-year dictatorship of General Augusto Pinochet. President Bachelet said in Santiago that the courts will continue to prosecute cases involving human rights abuses under the dictatorship. She said the memory of thousands does not allow an end to the trials. Ms. Bachelet made her remarks at a ceremony remembering people killed during the dictatorship. A long-time champion of women’s rights, she advocated for gender equality and women’s empowerment throughout her career. One of her major successes as President was her decision to save billions of dollars in revenues to spend on issues such as pension reform, social protection programmes for women and children, and research and development, despite the financial crisis. Other initiatives included tripling the number of free early child-care centers for low-income families and the completion of some 3,500 child-care centres around the country. What promised to be a historic visit to Cuba by a Chilean president, the first in nearly four decades, turned into a foreign policy disaster. President Bachelet's trip to the island (February 10-13, 2009) and Fidel Castro's offensive statement following their meeting on February 12 prompted widespread commentary and harsh criticism, particularly from Alianza and Christian Democratic leaders. Fidel Castro's statement bashing Chile following a private meeting with President Bachelet generated unusually heated debate in Santiago. Critics -- including the Concertacion's Christian Democrats -- call the visit an "embarrassing" policy setback, some contending the sole purpose was to bid farewell to a dying revolutionary with whom the President sympathized. Most Chileans view Fidel Castro's scathing columns as a rude and gratuitous stab aimed at disparaging Chile's political system and foreign policy. Fidel Castro despises the Chilean example for its successful transition from a dictatorship to a democracy with stability and prosperity. Indigenous conflict -- particularly between Mapuche and non-indigenous land owners in southern Chile -- forced itself prominently on to President Bachelet's political agenda following the 12 August 2009 police killing of a Mapuche activist. Over the past 20 years, relations between the government and Mapuche communities have been characterized by half-hearted attempts by the government and fractious organization and demands by the Mapuche, creating disappointment and frustration that perpetuate tension. Mapuche demands center on land, economic opportunity, and societal inclusion, but are poorly defined and vary greatly from community to community. On 16 January 2010 Former Chilean President Eduardo Frei conceded losing the country's presidential election to conservative billionaire Sebastian Pinera. With 99 percent of the polling places counted, official returns showed Mr. Pinera with 52 percent of the vote and Mr. Frei with 48 percent. The new president succeeded outgoing President Michelle Bachelet. She cannot run for a second consecutive term. Chilean authorities struggled to maintain order, distribute supplies, and rescue survivors after the powerful February 2010 earthquake that killed more than 500 people and damaged or destroyed hundreds of thousands of homes and buildings. President Michelle Bachelet attempted to rally her nation in the face of tragedy and devastation, while appealing to the international community for assistance. Bachelet leaves office with high public approval ratings, despite criticism of the government's initial response to the initial quake 27 February. In July 2010, the General Assembly voted unanimously to create U.N. Women, and former Chilean President Michele Bachelet was appointed head of the new agency. Under Ms. Bachelet’s leadership, UN Women will lead, support and coordinate the work on gender equality and the empowerment of women at global, regional and country levels.